Virtual reality has always excelled at taking the most bizarre of concepts making them a reality. I feel like the best VR experiences were born out of the question, “Wouldn’t it be cool if…?” Playing with the sense of scale in VR has also been done to incredible effect, whether it’s making the player a giant, peering down into a tiny world, or shrinking them down so that the environment towers around them. A Fisherman’s Tale does both, using both the bigger and smaller worlds in order to solve a variety of puzzles. 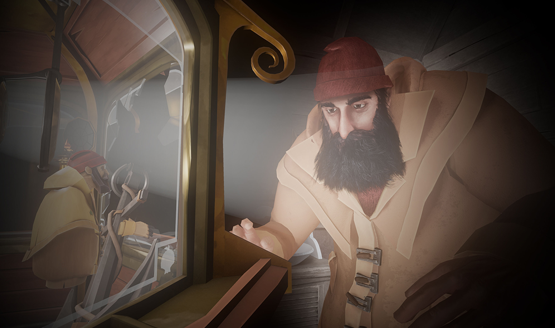 In A Fisherman’s Tale, you play as the puppet of a fisherman, living out his days performing the same routine in his lighthouse. Brush his teeth. Stoke the fire. Open the shutters. One day, that all changes when the world outside the window is different from the expansive ocean he is used to. Instead, he sees a giant version of himself and realizes he is inside the very model of the lighthouse that stands at the center of his own lighthouse, ad infinitum. Here begins a trial of puzzles that not only test your wit, but also tell an engaging narrative about being stuck in routines and how to escape expectations. Most of the puzzles revolve around moving larger and smaller objects between the worlds, depending upon your need. A giant anchor blocking a door in your world could be a key to a cabinet if taken from the smaller model. A small anchovy could become an enormous meal if passed between the worlds. As much as A Fisherman’s Tale would like to think it takes on the concept of infinity, it really just encompasses the three sizes (your own world, the larger world, and the smaller model), with the exception of a puzzle near the end that adds one extra layer and an added twist. That final puzzle tests object collision in VR, and not to the greatest effect either, so its extra dimensional layer is lost in the frustration of fighting with things to even get them to do the things you want them to. And that’s 25% of the game. Despite engaging and interesting puzzles, A Fisherman’s Tale never quite escapes feeling like a concept. The time between booting the game up and getting the trophy for completing the epilogue was a scant 57 minutes. There are only four levels (six if you include the puzzle-less prologue and epilogue) set in different sections of the lighthouse, each with one main puzzle to solve. Sometimes this main puzzle is built off of smaller puzzles, but with as multilayered as the concept of the game is, I was surprised that the puzzles barely scratched the surface of what this infinite sense of scale could potentially accomplish. When things took more of a narrative turn for the epilogue, I was left wondering if that was really it. Sure enough, once the credits rolled, I was booted back to the main menu. 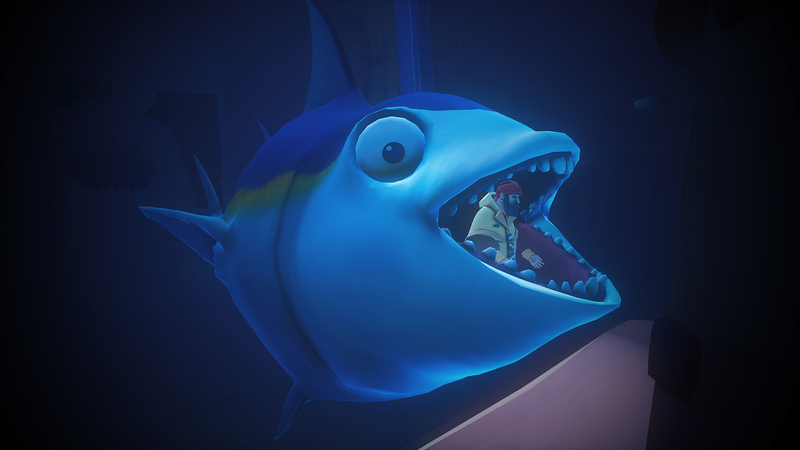 There are some interesting enough set pieces along the way, such as entering the mouth of a fish to briefly explore the larger universe outside of your own little lighthouse hut, but the game never really embraces those concepts as more than just a quick flash of possibility. It’s a fun moment, but then the moment is gone. I wanted to do more exploring of a giant environment as a tiny puppet man, or more manipulation of a tiny model that would impact the world around me. It’s not that the puzzles in A Fisherman’s Tale were bad. They just never extended beyond the initial “wouldn’t it be cool if…?” stage, which left me wanting a lot more. Beyond that main campaign, the trophy list does manage to offer up some chances for replayability, acting as almost a scavenger hunt for collectibles and weird interactions you may not have thought of performing during your first playthrough. A set of in-game skill points—relating to those odd interactions—and a collectibles checklist could have gone a long way in expanding the sandbox of A Fisherman’s Tale right in the game itself. If you didn’t check the trophies, you’d never know whether or not you had found all of the collectibles. If you’re someone that only likes to follow the golden path in games, A Fisherman’s Tale merely brushes on its puzzle mechanics and world exploration. Even going for the Platinum trophy, I can’t imagine the entire experience taking longer than two or three hours at most. Though I’m loathe to mention price in reviews, A Fisherman’s Tale is launching at only $14.99, a price more befitting of its smaller stature than some other premiums that short VR games tend to ask for. Stepping into the shoes of this fisherman puppet is far from a bad experience, but it hints at tales untold, puzzles unsolved, and potential unrealized for its unique idea. A Fisherman’s Tale feels like it could and should hold so much more within its endless lighthouses, instead choosing only to entrust the player with what seems like the bare minimum of simple puzzles. I want to explore those larger spaces as a small entity. I want to really dive into the machinations of my own reality using a tiny model of the environment right in front of me. All great VR experiences start with an idea. “Wouldn’t it be cool if…?” As much as I enjoyed my time with A Fisherman’s Tale, the unique concepts it bears and the surprisingly deep narrative carried on its roiling waves, it’s hard to recommend something so brief. Not to mention, the game feels more like a proof of concept for something far bigger, rather than a proper VR title in its own right. This lighthouse will always carry a forlorn sense that infinity isn’t quite as infinite as it is meant to feel. A Fisherman’s Tale review copy provided by publisher. Version 1.00 reviewed on a standard PS4 and PSVR. For more information on scoring, please read our Review Policy.